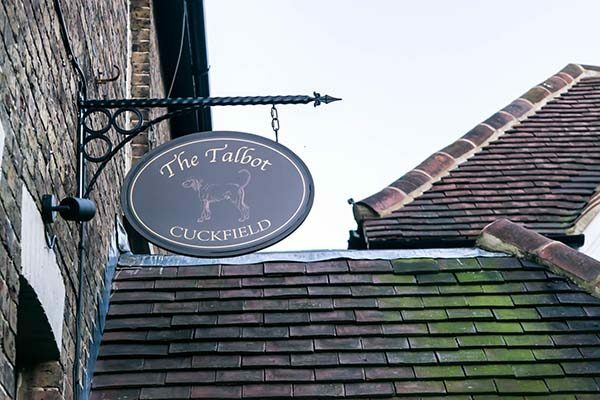 The Talbot sits in the heart of the picturesque Cuckfield Village, just twenty minutes drive out of Brighton. It’s easy to find on the high street, and after 6pm has free parking on the road outside. 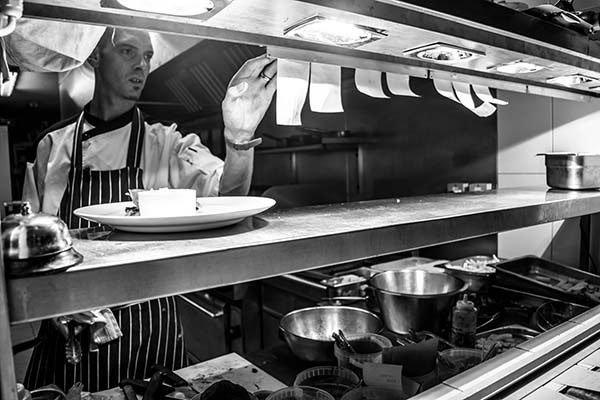 It’s a large venue split into the pub and restaurant with a beer garden for the sunnier days. When we arrived were warmly greeted at the restaurant entrance (where you can also see the kitchen pass and a glimpse into the hustle and bustle of the kitchen) then taken to our table. 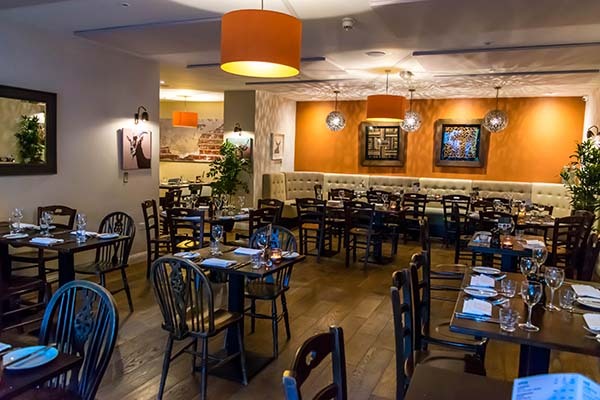 The restaurant was spacious enough so that you weren’t squashed in next to each other, yet it had a cosy atmosphere with ambient light, ethnic influenced furnishings and local art on the walls. I liked that you had enough space around your table that you don’t feel like you’re sharing your conversation with the tables next door! We ordered our drinks. 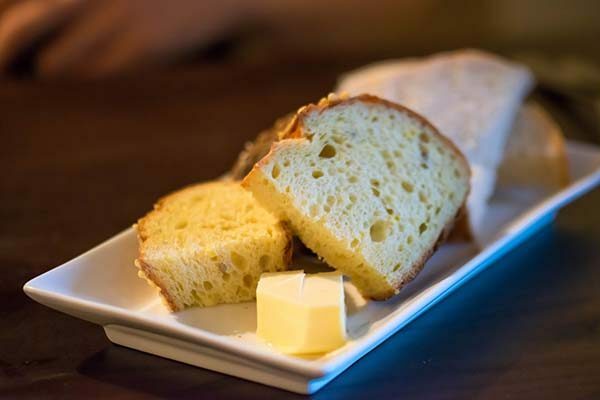 I chose a white wine which was nice and refreshing and we were given a little selection of breads including corn bread which intrigued me. It had a yellow tinge to its appearance with the slight taste of popcorn and little crunchy bits of corn on the crust, which I liked. It was a nice little tide-over whilst we pondered the menu (although we had to be careful to not fill up on bread!). The menu had a varied selection of food from traditional British dishes to some with a modern twist such as the Baked Chickpea Pancake with Brie, Confit Onion, Cherry Tomato and Rocket Salad (£6.50) on the starters which popped out to me straight away so was definitely ordering that. 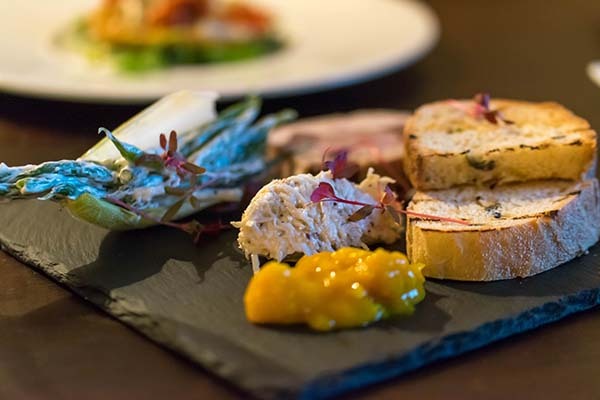 Dan chose the Confit Pork, Black Pudding & Garlic Sausage Terrine with Chicory & Green Bean Salad, Celeriac Remoulade and Piccalilli (£7.25). When they arrived they looked exciting and the presentation had been thought about. The green bean salad that came with the terrine had been displayed in a little ice gem lettuce leaf, a nice touch to the aesthetics! 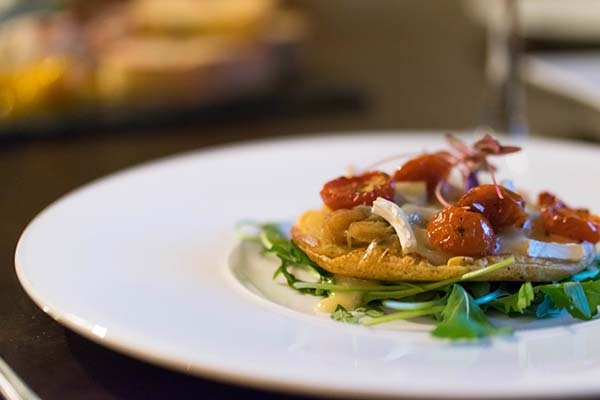 I couldn’t wait to tuck into my chickpea pancake, it looked lovely with the vibrant cherry tomatoes and tasted good too. The pancake had a nice bite to it, and acted as a base for the stronger flavours of the dish. 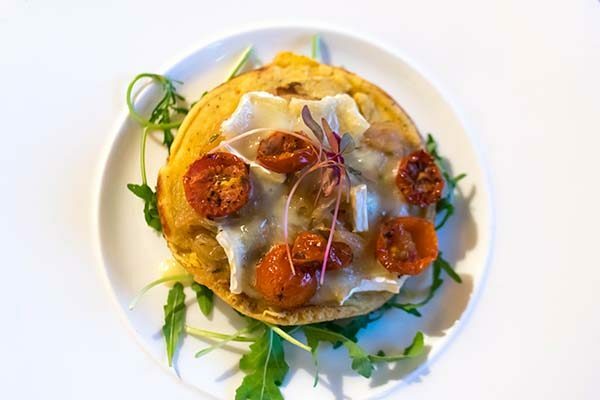 I liked the mix of flavours here, tangy cherry tomatoes, melted creamy brie with a slight hum and the flavour of the onions that gently carried through, all accompanied with the healthy savoury pancake on a bed of peppery rocket. This was a delicious starter I didn’t regret ordering. In fact I liked it so much I’ll be attempting it at home! 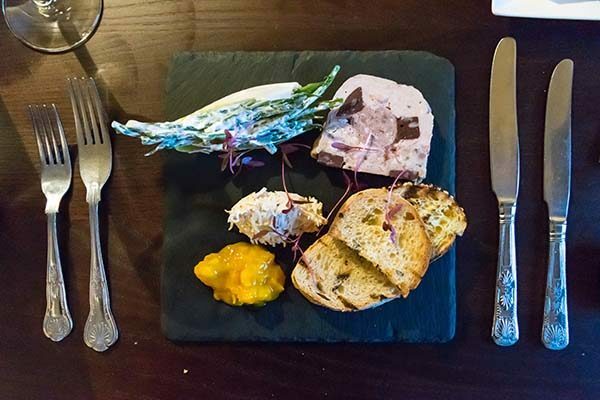 Dan thoroughly enjoyed his meaty terrine, there was a large hunk of the mixed pork terrine with different colours and shapes resembling the black pudding and sausage, so looking interesting to the eye. I had a taste and was surprised at how good the celeriac remoulade was, not being a fan of celeriac, this was subtle and creamy, it was lovely with the piccalilli and terrine. We had started the meal with two dishes neither of us regretted and they were both generously proportioned, they could possibly have done as a lunch portion. We didn’t have to wait too long for our mains and the restaurant was filling up this Thursday evening. There was a buzz filling the air of chat, consistently pleasing music lifting the spirits and smiles everywhere with the result of the hospitality of the charismatic, experienced staff. 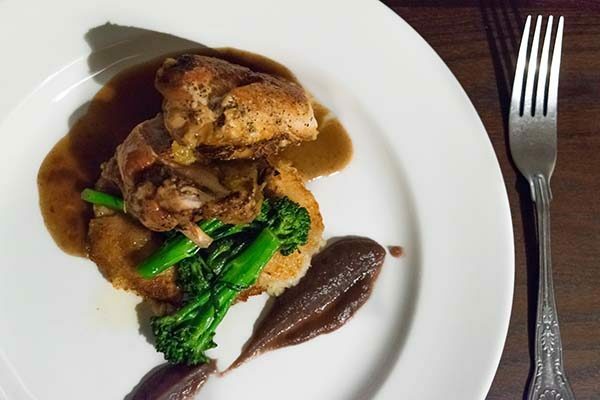 I was enjoying The Talbot and when our mains arrived I was enjoying it even more, I had an artistic looking plate placed upon me, which was the Roasted Chicken Breast with Almond & Apricot Stuffing, Goats Cheese Potato Cake and Roasted Onion Puree (£14.50), I tucked straight in. The goats cheese potato cake was deep and rich in flavour, accompanied with the juicy chicken breast which had been served on the bone and nutty sweet stuffing. The roasted onion puree was, in comparison to the other elements of the dish, more subtle which was a good balance. There was a gravy as well to moisten the plate with a couple of sprouts of tender stem broccoli. This was a tasty dish with strong flavours, and very filling due to the rich flavours and fats in the dish. I might be inclined to order a side dish of mixed greens next time just to split the heavy rich flavours up a bit, but boy was it enjoyable! 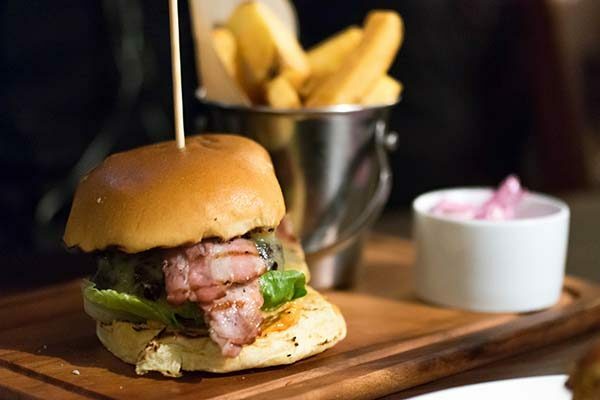 Dan’s eyes gleamed when his Talbot 8oz Beef Burger with Smokey Sauce, Tomato, Crispy Lettuce, Pickles, Coleslaw & Handcut Chips (£12.95) with the additions of Monterey Jack & Crispy Bacon (£1 each). 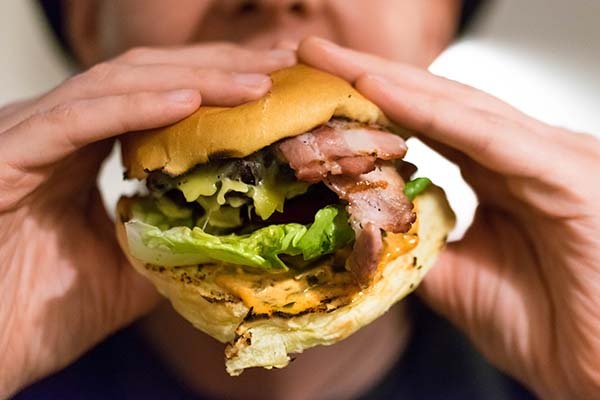 It was a big stack of layered meat, cheese, salads and sauces sandwiched between two toasted buns. It was BIG! The meat was slightly pink and juicy. When they said chunky chips they meant it, they were bigger than your fingers! Dan wasn’t able to finish his chips but thoroughly enjoyed The Talbot burger with all its flavours and glory. 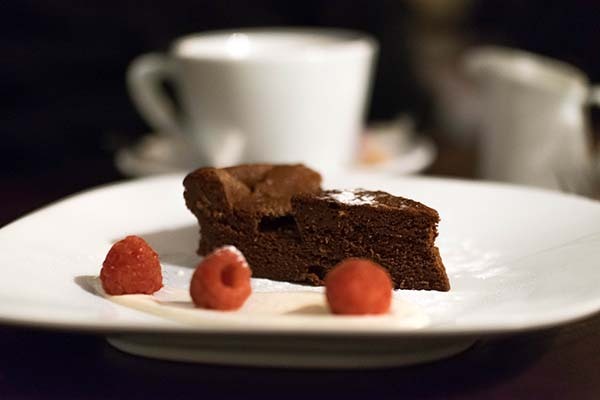 We were both quite full so decided to share a pudding, we went for something with a bit of caffeine so we didn’t get too tired on the drive back to Brighton, so opted for the Dark Chocolate Espresso Mousse Cake with Vanilla Creme Fraiche & Raspberries. It was a light dessert which wasn’t too sweet with a subtle coffee taste, and I thought it went well with the fresh, slightly tart raspberries. Overall we both really enjoyed the atmosphere at The Talbot. 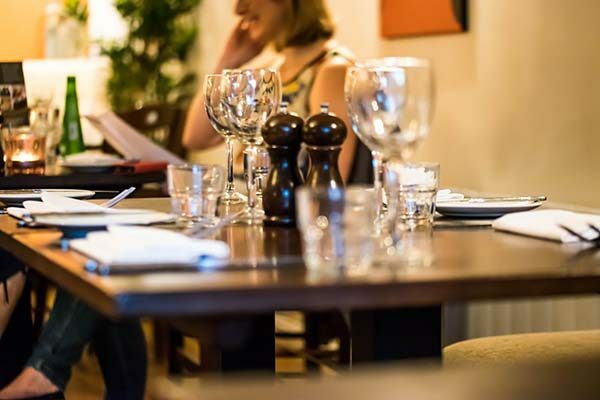 The staff had a lot to do with that, they knew when to check on things and by the time we left the restaurant it was full, yet the two members of staff seemed calm and enjoying themselves along with the customers. 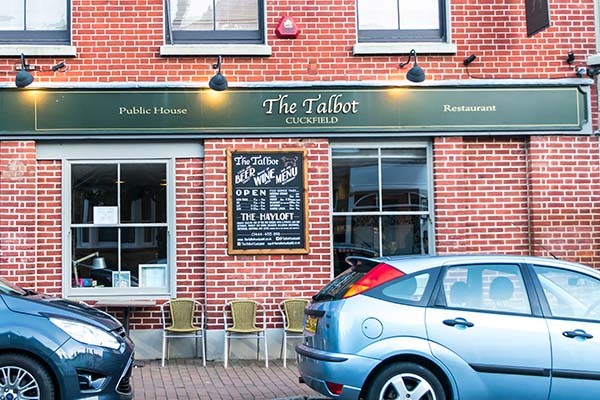 If you’re going to Cuckfield I would recommend The Talbot without a doubt for it does classics really well and has some inventive ideas for the more adventurous diners!